This is a sponsored post. I received complimentary products from NO-AD. All opinions are my own. See Disclosure/Disclaimer for details. My son asked me the other day why his light colored skin is called fair. “It’s not fair that I burn so easy when I am in the sun,” he explained to me. It is true that applying sunblock every morning and wearing a hat is a must for my son, but it something everyone regardless of skin type should do. It’s a common misconception that fair skinned people only need sunblock and shade, but when you learn how to be sun smart, you’ll understand that Melanoma doesn’t discriminate. NO-AD sunscreen reached out to me to help them share how Melanoma can be prevented. NO-AD is a sunscreen brand that doesn’t pay expensive advertising prices, and instead uses this money to produce a quality product that is affordable to purchase. They sent me a couple bottles of sunscreen in exchange for this post. I personally feel that sunscreen is liquid gold when it comes to the health of my family. Apply sunscreen 15 to 20 minutes before going out in the sun and reapply every two hours or after swimming or sweating. Use a golf ball-sized amount (1 oz.) each time you apply or reapply sunscreen. Sunscreen should be broad-spectrum, at least SPF 30 and water-resistant to help protect from UVA and UVB rays. If used properly, families should go through many ounces of sunscreen during a season in the sun. Remember, spray-on sunscreens MUST be rubbed into the skin to be effective. I have read other mom blogs that chastise parents for applying toxic lotion (sunblock) on their children. If they had researched skin cancer and sunblock use then they would have found a direct correlation between sun burns and skin cancer which could ultimately lead to death. NO-AD is reasonably priced and has received The Skin Cancer Foundation’s Seal of Recommendation for safe and effective protection. All NO-AD sunscreens are PABA-, paraben-, and retinyl palmitate-free. The only thing that is toxic is not wearing sunblock. On average, 1 person dies from melanoma every hour. Research shows women are 9 times more likely than men to notice melanoma on others. Nearly 9,500 Americans are diagnosed with skin cancer each day. The five-year survival rate for melanoma when detected and treated in its early stages is 98%. 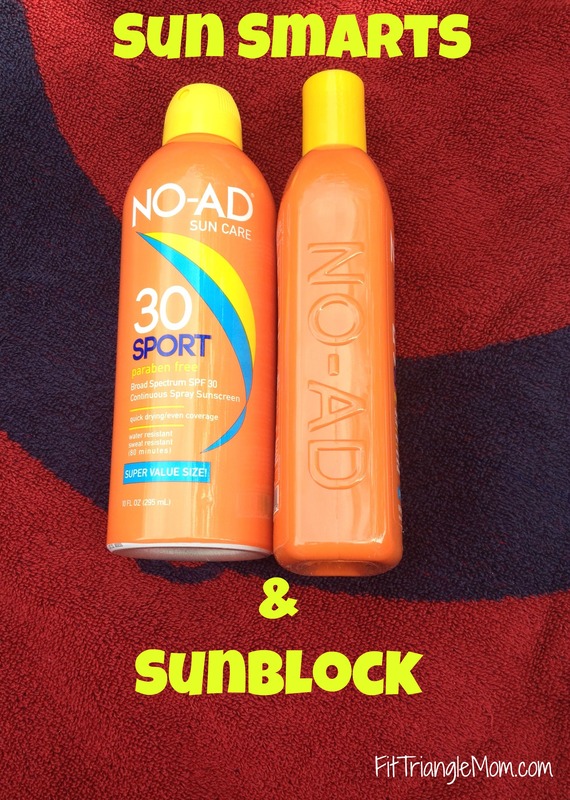 NO-AD sunscreen is available at mass, food, drug and military retailers throughout the U.S. and in 25 countries. What is important for you in a sunscreen? Excellent post, lots of good information as we head into the summer months. Thanks! I’ve been using the guide when I apply sunblock at the pool and almost everywhere. Yes, I used sunscreen all the time. The face sunscreen I mentioned on #sitsblogging is from my dermatologist and it is 50+ , I can really tell a difference because I would usually be peeling by now. Yes, you really need to find a sunscreen that works for your body. I like the NO AD face sunscreen b/c it won’t clog your pores. That’s interesting. Where do you buy capsule sunscreen?